Mechanics have long known the benefits of an impact driver. Pneumatic impact drivers have been used in auto repair for many years for their ability to deliver considerable power and torque to the object being driven without transferring the power or impact to the operator. This made them ideal for use in tire shops for removing or re-installing lug nuts, a task that was rather arduous using a lug wrench but one that almost became child's play with an impact driver. Not so long ago, the same type of technology was tested in cordless drills, and the cordless impact driver was born. Now today's small, handheld cordless impact drivers probably don't have the torque to handle removing or reinstalling the lug nuts on your car, but they are incredibly versatile not only in the woodshop but also around the house. It's Not a Hammer Drill! Some people tend to confuse an impact driver with a hammer drill function found on many power drills. While one might think they use a similar movement, they function quite differently. A hammer drill will move the bit in and out of the hole being drilled (think a bit like a jackhammer), which is ideal for drilling masonry. On the contrary, an impact driver's action is a very high-speed repetitive turn-stop-turn-stop motion. This action allows the impact driver to provide a much higher level of torque than a comparable cordless drill without the possibility of transferring the torque to the operator. The extra torque provided by the motion of the impact driver allows the user to be able to handle more difficult tasks with smaller tools. For instance, if one were building a deck with pressure treated lumber, driving one three-inch wood screw after another would tax the batteries on a standard 18-volt cordless drill. Performing the same task with a smaller, lighter impact driver not only drives the screws faster but with less effort for both the tool and for the operator. After using a standard cordless drill for the task, using the impact driver to drive three-inch screws almost feels like driving screws into butter. Can you use an impact driver as a drill? Absolutely. Matter of fact, drilling clean holes with a spade bit is much easier with an impact driver. One of the problems with drilling large diameter holes (1/2-inch and wider, up to about 1-3/8 inches in diameter) with a spade bit is that the bit can pinch and get hung up in the hole. When the bit gets stuck in the hole with a cordless drill (or worse, a heavy-duty high-torque power drill), a rotation that the motor was applying to the drill bit and chuck is then transferred to the body of the drill, twisting the drill in the user's hands. In the best of cases, the drill will slip out of the operator's hands, or worse, the twisting drill's torque can be transferred to the operator. With an impact driver, the potential for such an injury is reduced considerably. The start and stop motion of the driver's action applies torque in powerful, but small bursts, helping to keep the spade bit from sticking. Even when it does stick, the amount of torque kicked back to the operator is minimal. This makes the impact driver a perfect tool for electricians and plumbers, who need to drill a number of 3/4-inch and larger holes through studs for pathways for wiring and pipes. For anyone who has experienced a sprained wrist from repeatedly having a power drill wrenched in their hands, using an impact driver for the same task is a godsend. In most cases, impact drivers do not come with the traditional keyed or keyless chuck found on standard corded and cordless drills. Instead, the three-jaw slip chuck is replaced by a quick change 1/4-inch hex chuck. This type of chuck shortens the overall length of the body of the driver, allowing the impact driver to fit into smaller areas than traditional drills. It also enables bit changes to be completed much faster than a traditional chuck - you push in on the outer ring and slide out the existing bit before inserting the new bit into the chuck until it clicks into place. Of course, the drawback to a slip-style chuck is that you can only use 1/4-inch hex shank bits in the chuck. Fortunately, most spade bits and driver bits use this standard 1/4-inch hex size, but traditional round shank drill bits will need to be reserved for your drill or drill press. With the impact driver, the name of the game is versatility. Because of the power provided by the impact motion, a smaller motor (and hence, a lighter battery) can provide more torque and last longer between charges than a larger cordless drill. This becomes vitally important when you're using the tool for hours on end. The fact that the smaller size of the impact driver (when compared to a cordless drill) allows electricians, plumbers, and carpenters to keep the impact driver in a pouch of their tool belt, as opposed to carrying it separately. Sure, this might not be such an important feature in the woodshop, but the extra torque for drilling and driving will certainly be welcomed. One word of note when using an impact driver for driving screws on fine woodworking projects. 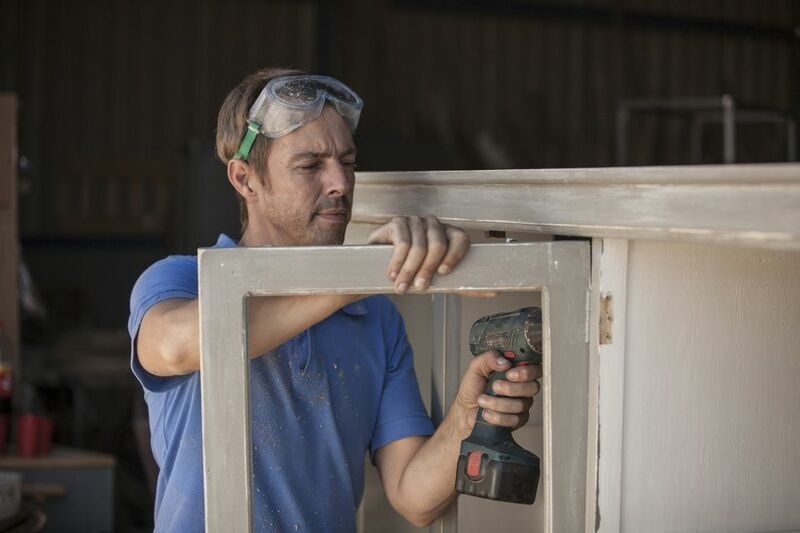 Because the impact driver tends to be higher speed and more torque than a typical cordless drill or cordless screwdriver, you will want to be careful to avoid over-driving the screw heads past the surface of the wood. The added torque of the driver can easily drive a screw head far deeper than desired.